Sometimes even the most simple things can surprise you with their beauty. Such is the case whenever I open the cupboard where I keep my jars of legumes and rice. 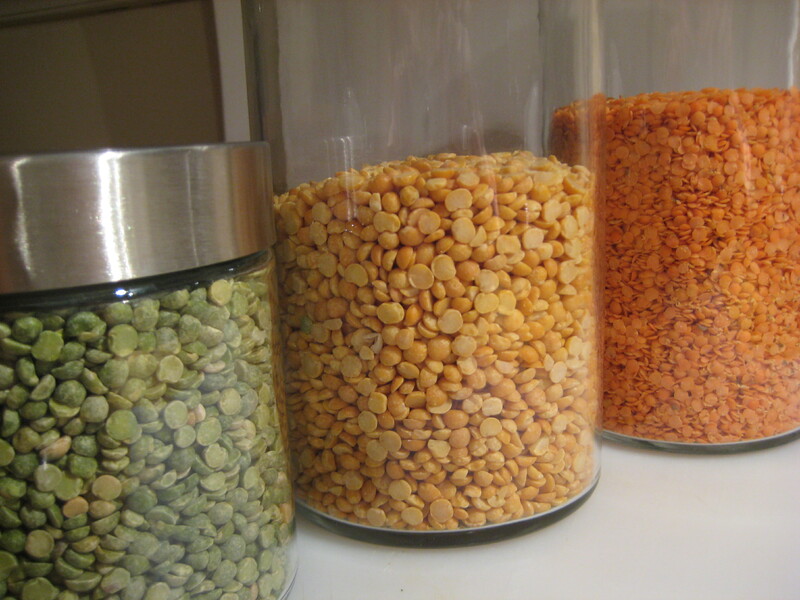 Look at the rich green of the green peas, the golden glow of the yellow peas, and the brilliant orange of the red lentils that almost seems illuminated. Such a palette from which to draw inspiration! Another beautiful thing happens when I transform those yellow split peas into a hearty, healthy soup. Just the ticket for a snowy January weekend. The richness of yellow split peas and the flavour and fragrance of the herbs are complemented by the smoky undertones from the smoked pork chop that cooks in this beautiful soup. And, as an added bonus, the flavour keeps developing as the leftovers are stored in the fridge … it’s even better the second day (and third). I found this recipe in the March 2011 issue of Food and Wine magazine. The recipe calls for green split peas, but I also like to make it with yellow (the colour is so pretty, and it reminds me of the French Canadian Habitant pea soup, but this version is much better than canned). I once tried both yellow and green peas together, but I think it looks better when only a single colour is used. I also modified the recipe by adding a smoked pork chop to the pot to infuse its flavour during the cooking process. The shredded meat adds extra substance and texture too. It’s totally optional, and the vegetarian version would also be delicious. I like to pick over the peas to ensure there aren’t any bad ones and rinse them before using. Add the peas to a large pot along with the water, and bring to a boil. Simmer for a couple minutes. The impurities will foam to the top, and I like to skim that off with a large spoon. Turn off the heat, cover the pot and let it stand for one hour. In a skillet, heat the oil. 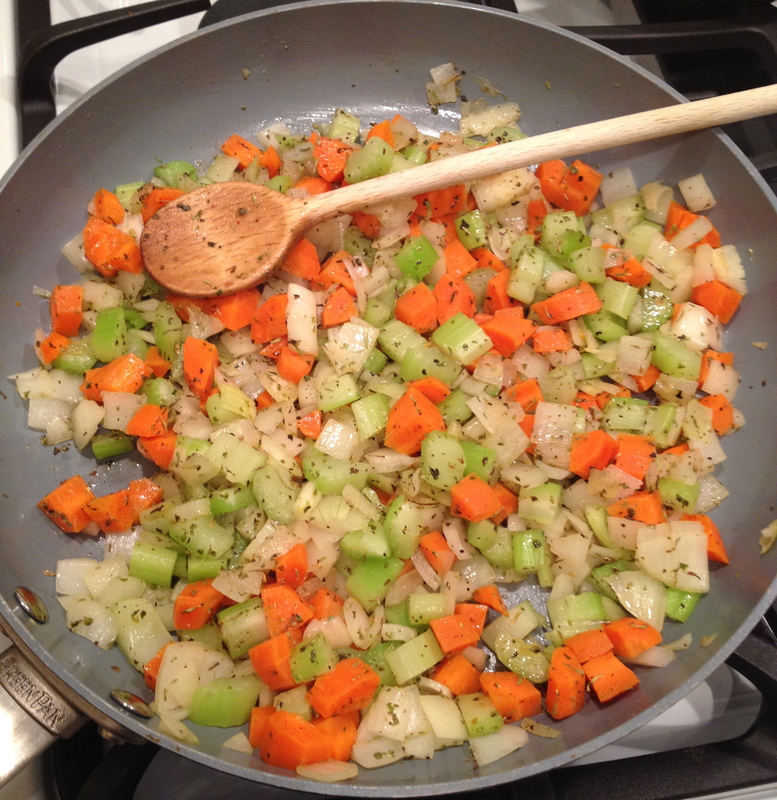 Add the vegetables and herbs and cook over moderate heat, stirring from time to time until the vegetables are softened (about 8 to 10 minutes). Of course, I can’t resist adding some ground pepper to the veggies as they are cooking. Add the vegetables to the pot of water and peas, along with the smoked pork chop. Bring the mixture to a boil, then turn down to a simmer. Cook for 2 hours, stirring occasionally. The peas will start to break down and thicken the soup. About 10 or 15 minute before it’s ready, check for seasoning and add more pepper to your taste, and some salt if you feel it’s needed. Remove the pork chop from the pot. Trim the fat and remove the bone. Using a fork, shred the meat, then return it to the pot. This is one seriously satisfying soup that tastes even better the next day. It’s a great way to show a little legume love! Previous Mise en … whoops! I use the yellow peas too — and since the girls can’t get enough of this soup I don’t want to risk trying out the green ones. However I have never added thyme or marjoram to the soup so I will have to give that a go one of these days. It is such a comforting soup, isn’t it? You’re right, it is a comforting soup, so hearty and nourishing. I love the colour of it when made with the yellow peas. I tried yellow and green together, but the resultant colour was muddied. I’ll try a green pea soup one day but will change up the recipe for variety. Thyme and marjoram both add such a herby brightness; I especially enjoy marjoram and use it in lots of things.